Folks, this stuff is the bee's knees! And I've included a a dairy-free version...doesn't get much better than that! Side note: I recently discovered that "bee's knees" may have derived from "business"...meaning this stuff is the BIZ-NASS!!!! If you have issues with dairy, I recommend plain non-dairy yogurt (like So Delicious Cultured Almond Milk Yogurt) instead of sour cream and ghee instead of butter. Grease your skillet or baking pan and set aside. Combine all of your dry ingredients in a large mixing bowl and whisk until well combined. Do the same for the wet ingredients in a separate, smaller bowl. Pour the wet stuff over the dry and mix well. Using your spatula, transfer the batter into your greased skillet or pan and shake the skillet to smooth the surface out until it's all uniform in the dish. Drizzle some honey over the top. Hell yes. Place on the middle rack of you oven and bake for 20-25 minutes or until a toothpick comes out clean from the center. Enjoy! 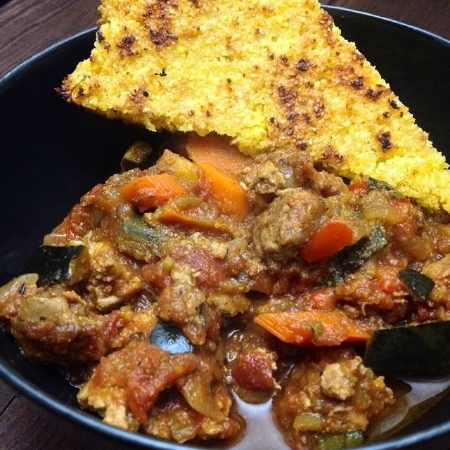 This is the perfect time of year for homemade cornbread on the side of a big bowl of chili! I was lying on the couch with my kitties one night after dinner and I started thinking about dessert. It happens. Because I don't bring junk or processed food into my house, when I decide I want to make something sweet, it's usually a very experimental and creative process. I tend to enjoy sweets that you can bite into, like cookies, brownies, etc. I'm not a huge fan of ice cream, frozen yogurt, or popsicles because they melt too fast and are extremely sweet without being satisfying. I need texture. THIS recipe gives me everything I need and more. It's creamy, dense, nutty, doesn't melt like traditional ice cream, and tastes amazing. Plus, the possibilities for toppings and add-ins are endless! *If you want to experiment with other fruit options, keep in mind that bananas have the lowest percentage of water in their flesh. Any other frozen fruit will likely yield an icier texture with a higher tendency to melt. But don't let that stop you. Next time I'm going to try frozen mango and roasted coconut flakes! Add the roasted nuts to your food processor and process until smooth. Add the frozen banana and process again until smooth. Follow steps 1-2 above using only about 3/4 of the nuts and banana. Once the mixture is completely processed and smooth, add the remaining nuts and and pulse until desired chunkiness is met.